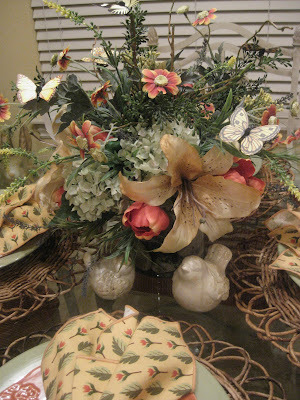 Kristen's Creations: Tablescape Thursday...Tulips, Birds and Butterflies...Ready For Spring! 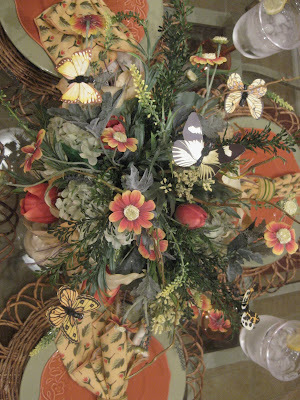 Tablescape Thursday...Tulips, Birds and Butterflies...Ready For Spring! Hey Guys! I hope your week is going well! The weather has been nice for the past several days and has put me in a spring decorating mood! I have been wanting to join in on Tablescape Thursday for a while and finally got something together. Head over to Between Naps on the Porch for a list of all the participants. 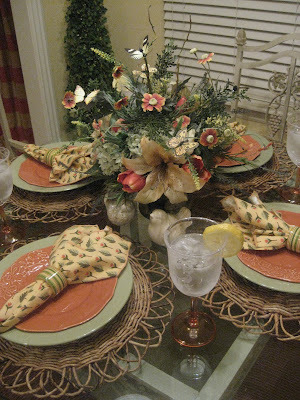 I decided to go with springy citrus colors...the napkins gave me my inspiration. I bought them last year at Dillard's. They have little tulips on them and I found the perfect fresh tulips at Wal-Mart for the centerpiece. I think I did that once before...oops! I wish these tulips would last forever!! I added lemon and lime slices down in the water since I was going with citrus colors. I bought the little birdies at Hobby Lobby. 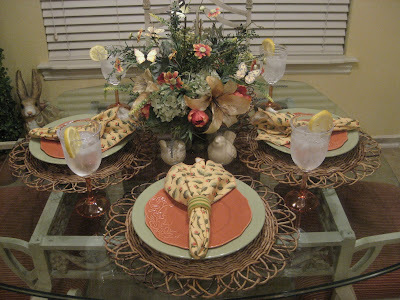 The placemats and green plates are from Pier 1 Imports. I love that place! I will be making some arrangements with birds and butterflies for my Etsy store soon. These butterflies just make me happy!! Now for my spring terrarium...more birds and butterflies! 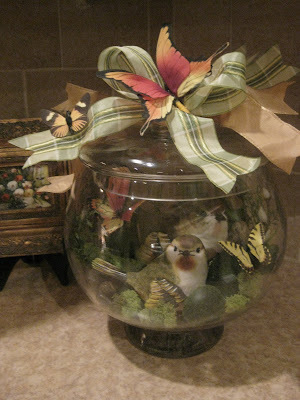 The bottom of the jar is filled with moss and rocks... then I added some willow, grass, birds and butterflies. I topped it off with some pretty ribbon and more butterflies...Ahhh...this says SPRING! Thank you for your visit!! I hope it's warm in your neck of the woods! Have a great rest of the week! Tulips are my favorite flower....Great job..
What a beautiful color of tulips! So nice. Your table is lovely. Very pretty with the tulips, birds and butterflies! I really like how you arranged the tulips with the lime slices. Your napkins are the perfect accent! The silk floral arrangement is a close second to the fresh flowers. 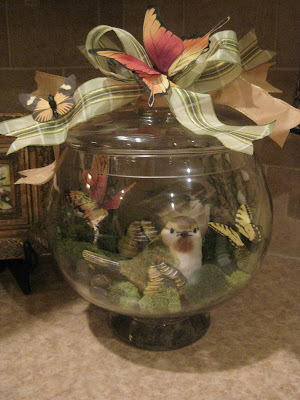 Once again, your birdie/butterfly terrarium display is fantastic! This is Gorgeous!! Really caught my eye, especially the more "aerial" view. 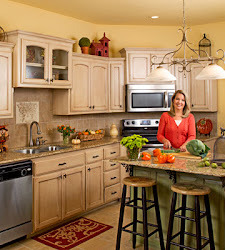 I love visiting your blog to see your latest decorating projects. Thanks for the inspiration! Kristen, I received the tassels and they are even prettier than in the pictures. My daughter will love hers, if I can stand to let one go. Your table is so stunning, the centerpiece is breath-taking and I love the terrarium. You should sell that centerpiece. Love the scallop design on those wicker placemats, Kristen. Love your Spring tablescape! When I did a couple of tablescapes I forgot silverware, too. Very nice! I love the wicker chargers too! This is just beautiful and so earthy and warm. Love it so much!! Everything looks so beautiful Kristen! I love your choice of the citrus-y colors...so perfect for spring! I love the colors!! That is one very happy and beautiful tablescape! How pretty and cheery! I love the coral and green colors; the tulips are a perfect match and are beautiful! I really like those place mats too! You had a visit from the same little birdies that I did this week. Love the tulips, too! They last such a short time, but so worth the effort of putting them out. Your colors are so pretty & soothing. Thank you for sharing. Oooh...what a beautiful Spring table, Kristen! I just adore the pretty coral with the green colors that you used! Love your place settings...they really couldn't have been matched any more perfectly with those gorgeous tulips! Ohhh...sooo pretty! 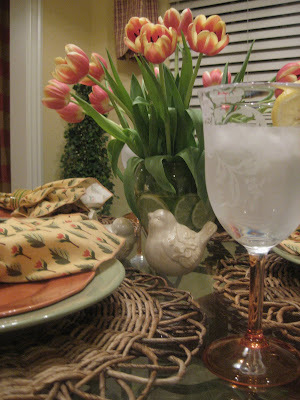 Ohh yes, and your pretty tulip napkins are just perfect as well! It's all really lovely, my friend! I love how you added the slices of citrus into your vase of tulips! I will have to remember that trick...it's really pretty! Of course, I love your faux arrangement just as much...you always, always...make the prettiest arrangements!!! I am just picturing you...busy, busy...making all kinds of gorgeous Spring arrangements, Darlin'! Hehe! Oh yes, and your little Spring terrarium...fabulous!!! You always have the prettiest things...it's such a treat coming to your place! Thank you so much for sharing them with us today...I loved it!!! PS...I'm still really enjoying my pretty toile bird tassel! I think of you everyday when I see it! Kristen this is truly beautiful, I so love the colors and the tulips are gorgeous. Makes me wanna rush out and buy some :) Have a blessed day and thanks for sharing. I just love your glass jar....terrarium....so pretty!!! What a lovely table. I also love the terrarium! 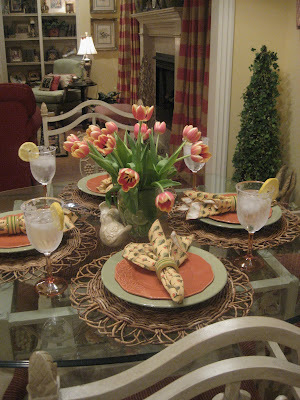 The napkins are darling and the tulip centerpiece worked so well with them. I also love the placements! This is a great spring table. My first visit and so glad I came by. Love the tulips and the colors you combined on the table are gorgeous. 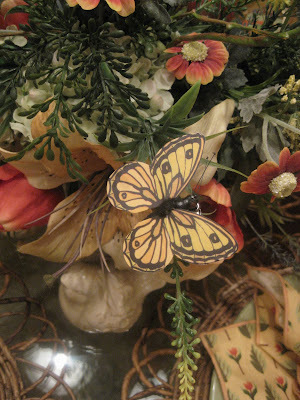 Love that silk flower arrangement also with the butterflies. Just beautiful. That is a beautiful table! 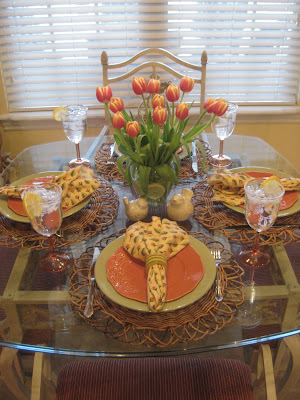 I love the napkins, the placemats and the tulips. I like how you put the citrus into the tulip water - looks cute! Beautiful table, love that the tulips match the napkins! 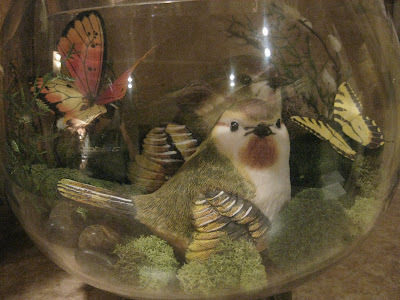 Adorable terrarium with the birds. So glad you decided to join Tablescape Thurs!!! I love your springy table. The colors are so pretty, soft and happy! I posted a St. Patty's table if you would like to come see! XO, Pinky PS, I love your different terrariums!!! That is a beautiful table. Love the tulips and the earthy textures.. 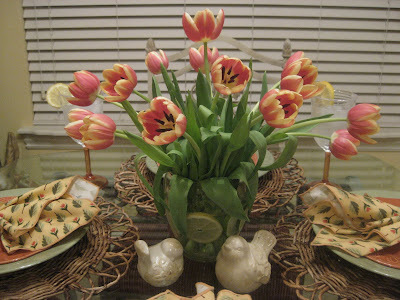 I love the tulip arrangement with the lemon and lime slices in it. That is so creative. I would never think to add them into a floral arrangement. Your tablescape looks so pretty! Your tulip napkins are such a great inspiration for a pretty table, Kristen. And the flowers are gorgeous!! Don't you love Walmart. And I love Pier I too, and your place mats. They go with everything. I love tulips - they are one of my all time favorites! ~WOW! Kristen this is so Spring like and beautiful! I just adore the tulips and your gorgeous bird terrarium. How precious! It is all so lovely and putting me in the mood for Spring. PS I bought a bunch of cute new clothes yesterday! That felt sooo good! Pictures coming soon...I'm still not used to how I look yet. It's kind of "different" to be thin again. I like it don't get mne wrong. LOL! I am a tulips lover. Living near The Netherlands is a dream to many tulips lover. Love your romantic, gorgeous and so spring-y feeling settings. Cheers for the good job. I hope your tulips last a long time. They are gorgeous. Your table is beautiful. I love tulips. Beautiful! It really made me think of spring! I stopped by to welcome you to SITS! It's great to have you in the SITStahood! Oh I can't wait! Would it be too much to ask for an Etsy preview? Ha! I want to be the first to buy your new arrangement. Lotsa love Kristen! Love love love tulips and the lemon and lime slice are an unexpected touch too! Stopping by to welcome to SITS! That's really gorgeous. I seldom find the time to do a proper table display. Stopping by from SITS to welcome you! Wow what a stunning table! Your little dog on the sidebar is adorable too! I'm just stopping by to welcome you the the SITS family! 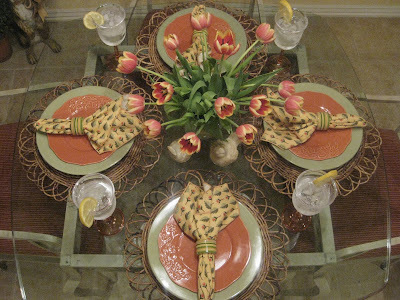 The color of the china and napkins are gorgeous with the tulips. I LOVE the mats from Pier 1...they are so cute! That looks great! I am always a fan of a well-dressed table. I do my dining room table up too-- then I don't allow anybody in the room! Stopped by to welcome you to SITS! How pretty! 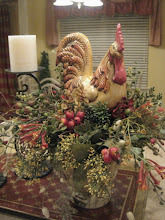 I am a fairly new follower of your blog and enjoy visiting:) I love your tablescape. Love the orange color. Very pretty and springy. The tulips are just right for this time. Thank you for sharing with us. Welcome to the SITS community! Holy wow! What a beautiful tablescape! 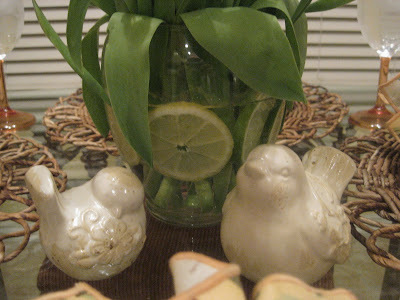 I especially like the small touch of the lemon and lime slices in the tulip water. Very nice touch. I love the peach colors. Beautiful table! That's a gorgeous tablescape! I love tulips too! Stopping by from SITS! Welcome. Wow! That is crazy beautiful! Sorry I havent been around much. Have been trying to spend more time with the family and less time on the computer. 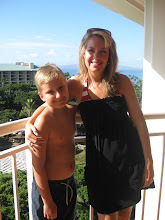 Just got back this second from family vacation, will blog about it soon so stay tuned! Hope all has been well, send all our love to the family! This is so fresh and adorable Kristen! 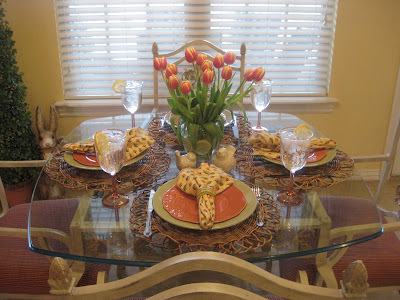 Love your color choices, looks great with the fresh tulips and the faux fresh floral centerpiece as well! That cute little bunny in the background caught my eye too!! More Spring Arrangements In My Etsy Store!